This was my experiment today. I did a tiny portion just to try it out. 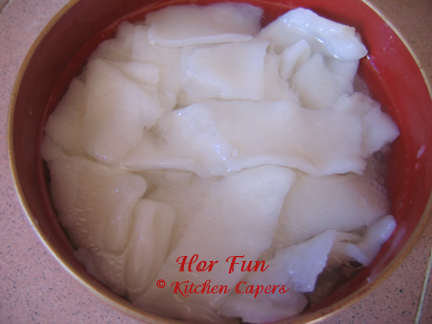 I used the same cooking method for the Glutinous Rice Noodle and found that this method is easier to handle the noodles than to standby the steamer to do it layer by layer. I may need to flatten it more to get a nice flat noodle. 1. Blend the cooked rice with water, salt till its paste like. 2. Add tapioca flour to knead into a smooth soft dough. 3. use the pasta machine to roll into a thin flat sheet. 4. Dust with flour and roll up like a swissroll. 5. Cut into desired sizes. 6. unroll the cut noodles and cook in hot water and 2 tbsp of oil till soft. Waahh..Gina, your hor fun very authentic looking. And you're right, definitely easier than the steaming method. How do you find the texture? And is tapioca flour essential to the recipe? Can sub with other flours? I haven't tried it fried. But we had it as a soup dish.